When we return in January, our new topic will be 'Carnival.' We will be looking at Carnivals across the world, eventually comparing the Rio de Janeiro Carnival with the National Eisteddfod. We hope to look at what carnivals are, what they do, what they wear and why they are held. In PE, we will be learning a traditional Samba routine and a Folk Dance - which will be a new and fun experience for us all. We will be aiming to hold our own Carnival for parents and guardians towards the end of the Spring Term, so we can show you everything that we have learnt. Details will be released closer to the time. In Dosbarth Gwyrdd we will be having a new role play area - Carnival Crafts. Where we will be designing and making masks, head dresses, jewellery and carnival wear. Any donations of art and craft materials would be greatly appreciated to help us create amazing Carnival outfits. Thank you very much. We cannot believe our first term in Year 1 is over already! We have settled in so well :) Our last two weeks of the Autumn Term have been fun; we have been to the Pantomime to see Snow White, we have had challenges from Santa to estimate how many cups of tea he can make with each tea pot and he even paid us a visit! Miss Stewart, Mrs Thompson, Mrs Jones and Mrs Handscomb would like to say a huge 'Oh Ah Superstar!' to each and every one of you. You have made us extremely proud this term and we are positive you will continue to surprise us in the new year. Also a massive 'Diolch yn fawr' to all the parents and guardians for your continued support. It is greatly appreciated. 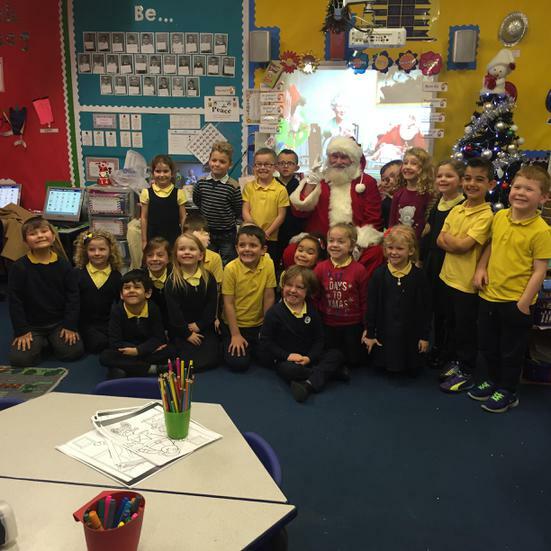 This week, Dosbarth Gwyrdd had a very special visitor... Father Christmas! 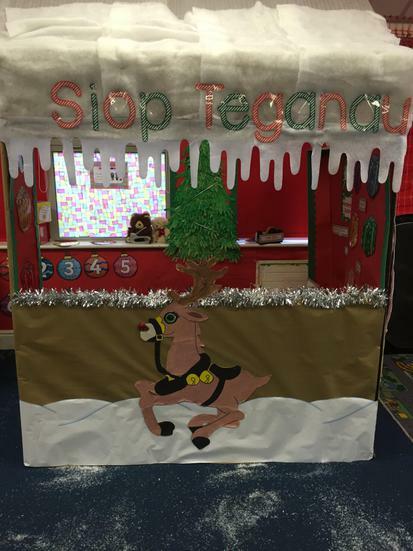 He visited our classroom on Tuesday night and because we have been working extremely hard, he decided to change our role play area into his Siop Teganau (Toy Shop). 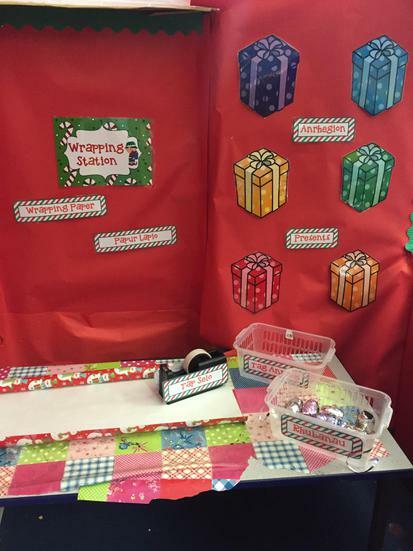 We have to take toy orders, design toys, wrap them, write gift tags and then quality control the presents before they are ready to be delivered. It has been such an exciting week, and we have loved being elves! But, something else magical happened in the classroom too... The elves have been checking up on us, without us knowing. It's a good job we have been trying our best! 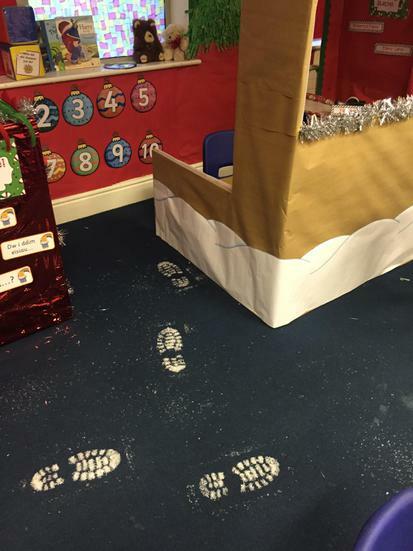 Have a look below to see our Christmas Classroom makeover and the video Santa sent us through! As we are practising our wrapping skills, it would be greatly appreciated if anyone would be able to donate any spare rolls of wrapping paper please? We are so eager to wrap presents and we have gone through 4 rolls of wrapping paper already!